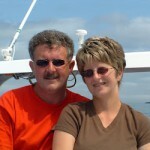 Your hosts at View of the Sea Cottages, Mark & Gina Ryan. We have been in business since 2001. We have had visitors from all over the world, Germany, Japan, Poland and many,many from across Canada and the USA. The most common question we get asked is “when is it a good time to reserve a cottage for the summer?” Well, often we have visitors that are staying with us one year book for the following year. If you are interested in visiting Cape Breton next summer and would like to stay with us, you may want to inquire now what is available, especially if your vacation dates are not flexible. So to avoid disappointment, please drop us a line for availability.